The 1200 Series (1200 CFM) unit is ideal for residential applications where a larger (3 ton and up) HVAC unit is installed. 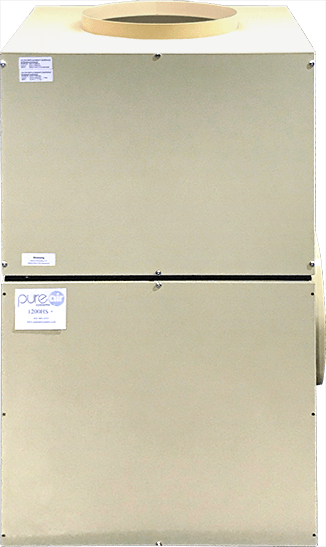 Along with attaching the 1200HS unit to the HVAC system the power of the 1200HS allows it to be used as a stand-alone filtration system and move HEPA filtered air through a large portion of a home or residential structure. The 1200HS HEPA series comes in a number of configurations to accommodate any residential application requirement. 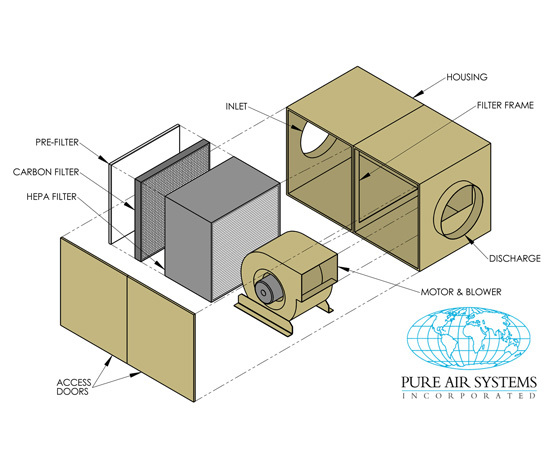 We’ll help you decide which Pure Air Filtration System is right for you. 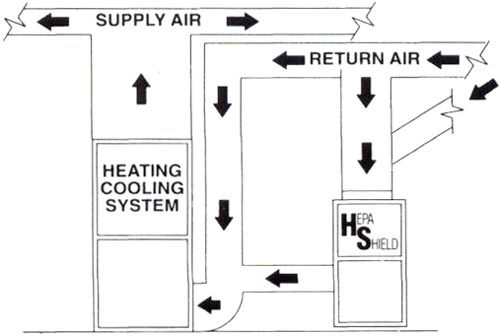 Introduced in 1999, the 1200HS Hepa Shield system represents one of the more powerful certified HEPA air filtration systems in our product line and is used in a wide variety of filtration applications around the world. 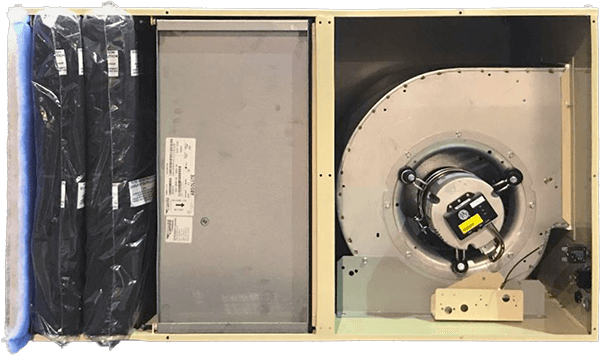 The 1200HS unit utilizes a ¾ HP GE (Genteq) ECM variable speed motor rated at 120/240 volt, 50/60 Hz and provides over 1200 CFM of HEPA filtered air with finite control of volume and speed while using up to 50% less electricity than standard induction motors. The 1200HS units offer true 21st Century digital motor technology that is unavailable in any other system of its size. The 1200HS unit was designed to be used in a wide range of applications and installation configurations. Either the “L” or “S” versions can be attached to any forced air ducted heating/cooling system in the partial by-pass configuration; in-line in HVAC applications for same air volume applications or stand-alone configurations. While the “L” version is most often used in partial by-pass configurations, the “S” unit can be used as well for situations where the “L” unit will not work. Either the “L” or “S” versions can be used for stand-alone applications. The top and bottom are symmetrical so they can be rotated in any of four directions for best inlet or discharge configuration. The HVAC controller is most often used when the 1200HS unit (either “L” or “S”) is attached to a heating/cooling system in the partial by-pass configuration. The HVAC controller allows the 1200HS system fan unit to modulate (speed up and ramp down) in conjunction with the HVAC fan/motor operation. For applications where the 1200HS unit is used either in-line with an HVAC system or as a stand-alone unit, the VCU controller is utilized. The VCU controller allows for air flow speed control from 1% of volume to 100% of volume in 1% increments. 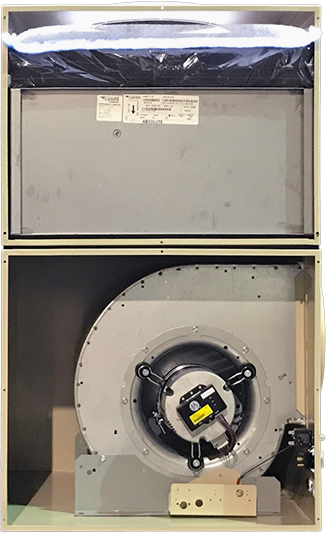 The 1200HS “L” unit comes in two separate sections, the top half houses the three filters and the bottom half houses the blower/motor assembly and controller. The top and bottom are symmetrical so they can be rotated in any of four directions for best inlet or discharge configuration. This also allows for best access to the filter section via the filer access door. The “S” unit is a single piece unit that can be mounted horizontally right side up or upside down or in a vertical position. The 1200HS series, like all our systems, use a three-stage filtration process. 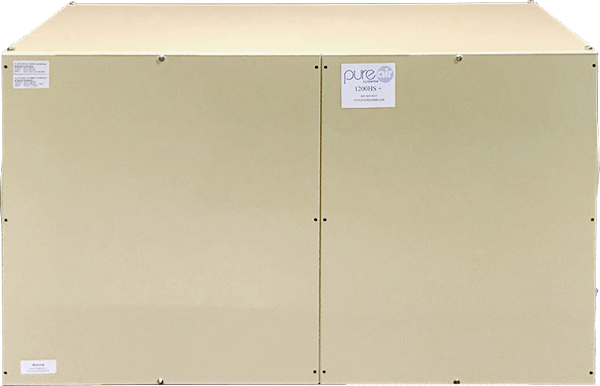 Each unit includes a commercial grade dual-layer polyester high capacity ring panel that is the first stage of filtration and is designed to remove the larger particles and protect the carbon and HEPA filter. The second stage is the 15lb carbon media that is designed to remove odors and gases. 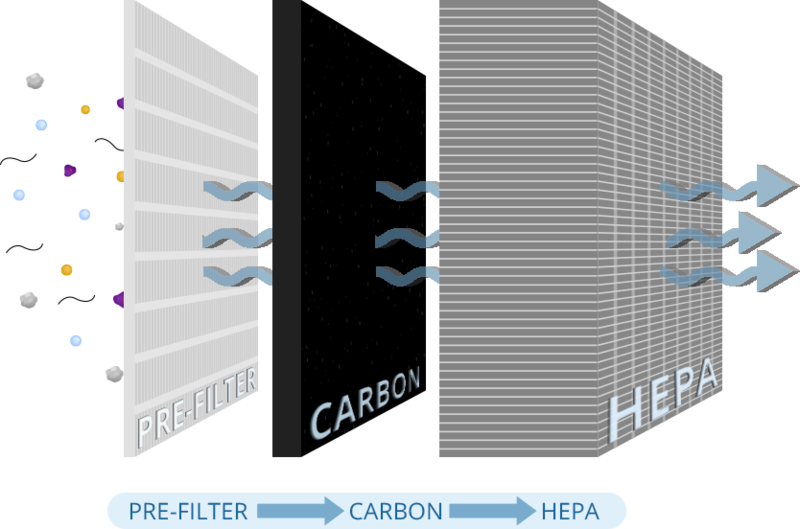 The final stage is the certified, commercial grade, metal framed HEPA filter rated initially at 99.99% at 0.3 microns. 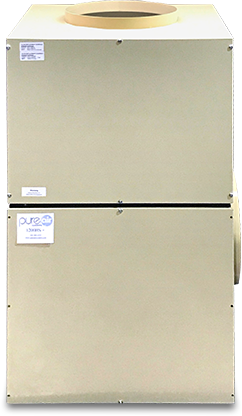 For applications where the issue is primarily odors and/or specific gas reduction or removal the 1200HS can be configured with all carbon media in-lieu of the HEPA. The “L” version will accommodate up to 60 lbs of carbon with one pre-filter and the “S” version will accommodate up to 75 lbs of carbon with one pre-filter. The 1200HS unit can be attached to a 3 ton or larger forced air ducted heating/cooling system in the partial by-pass configuration. 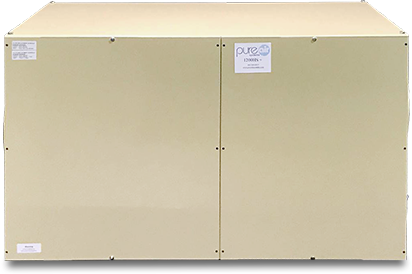 This allows us to attach the 1200HS unit on systems ranging from 3 to 5 tons (1200 CFM to 2000 CFM) capacity and provide very efficient, very effective whole-house filtration. 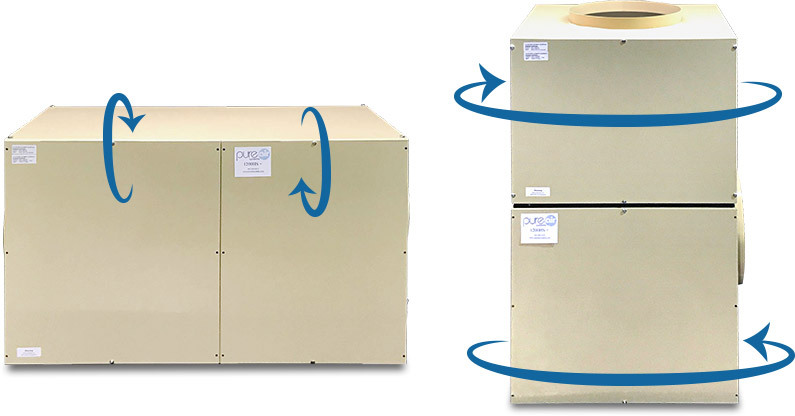 The partial by-pass configuration means there is no additional static load placed on the HVAC fan/motor and even in the by-pass configuration the 1200HS will provide up to 48 air changes in 24 hours in most homes and offices. The schematic below shows a typical by-pass configuration for the 1200HS (both “L” and “S” versions). The 1200HS can be used in this configuration for homes and small offices. In situations where the 1200HS is being used with an HVAC unit and there is a requirement for 100% filtration all the time the 1200HS can be installed in-line on 3 ton systems with the same air volume capacity of 1200 CFM. When used in this configuration an emergency by-pass damper and duct system is required to eliminate any static load issues with the HVAC fan/motor should the 1200HS unit shut down for any reason. In situations where this is no forced air ducted HVAC unit the 1200HS unit can be used as a stand-alone unit where you can mount it in an attic, false ceiling or basement area and run ductwork from it and to it and it will operate as an independent filtration/air moving system. The 1200HS unit could be used in this mode in a home or office environment up to 1500 square feet. 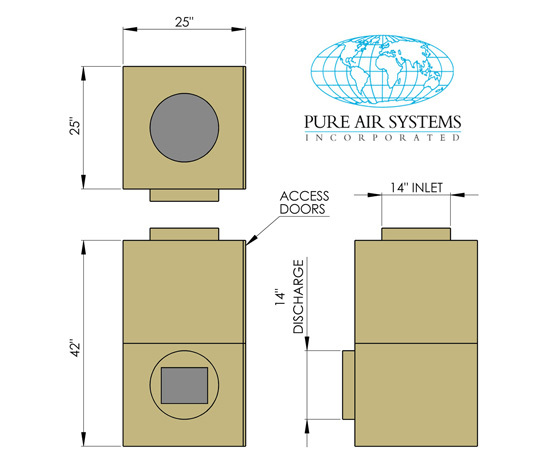 Whether the 1200HS unit is installed in the by-pass, in-line or stand-alone configuration small amounts of outside air can be introduced into the occupied space through the 1200HS unit. 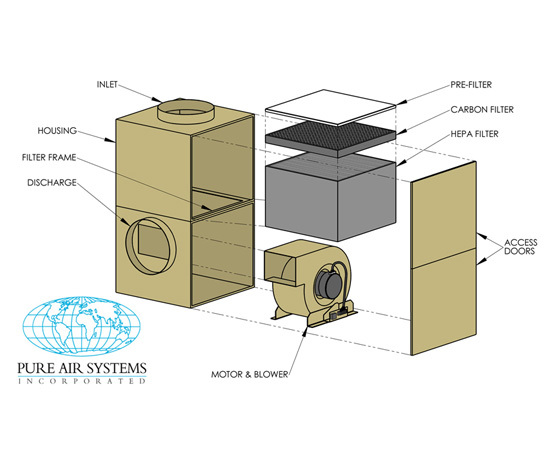 This allows for the introduction of filtered, outside air and can assist in both pressurizing the home or office eliminating the possibility of outside contaminants from entering the inside space. This can also help with reducing the levels of CO2. Most people with some basic handyman skills can install any of our air filtration systems themselves. We provide step-by-step instructions to help you through the installation process. If you’re not a do-it-yourselfer or you don’t have the necessary tools, we will connect you with a local HVAC professional who will install your system for you. Please contact us for more information: 1.800.869.8025. The 1200HS “S” Version is specifically designed to be mounted above or below the ceiling. With a 3/8 inch weld nut located in the four corners of the unit it is very easy to suspend the 1200HS-S. 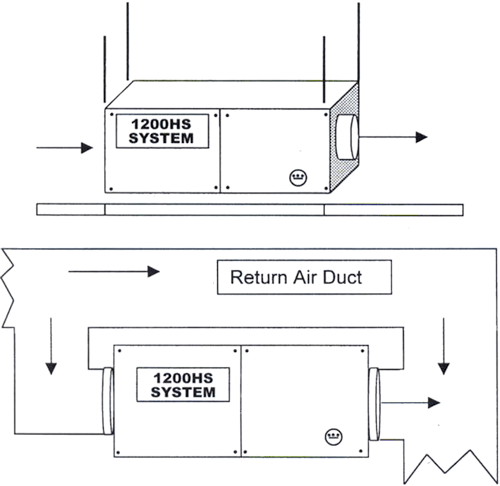 The 1200HS “S” Model can also be attached to any forced air HVAC system in a partial by-pass configuration. The 1200HS Plus “L” Model can be attached to any heating/cooling system, 3 tons or larger. The split housing design allows for left or right hand installation. It can be used with up-flow, down-flow, attic or crawl space system and even in a stand-alone configuration. Can be mounted horizontally or vertically. 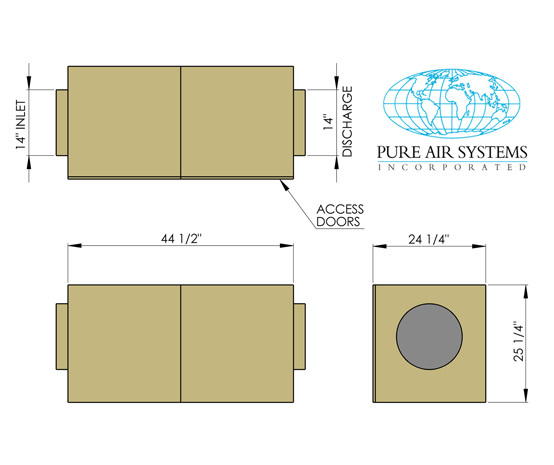 You can introduce, outside filtered fresh air through the 1200HS Plus unit.